Three steps on the podium. Three is the magic number. The holy trinity. The best things in life are three...wait, that’s wrong. Ok, look, I could spend hours justifying this structure with bad puns, but the fact it, I like the idea of breaking this Giro preview into threes: it allows me to cover what I think are the pivotal factors, whilst leaving no room to hedge my bets. Three reasons why the Giro is great, three favourites for the Maglia Rosa, three riders who’ll make a strong showing, three stages that will shake out the GC and finally, my predicted podium. Simple. Pink and fierce, just like Miss Piggy. 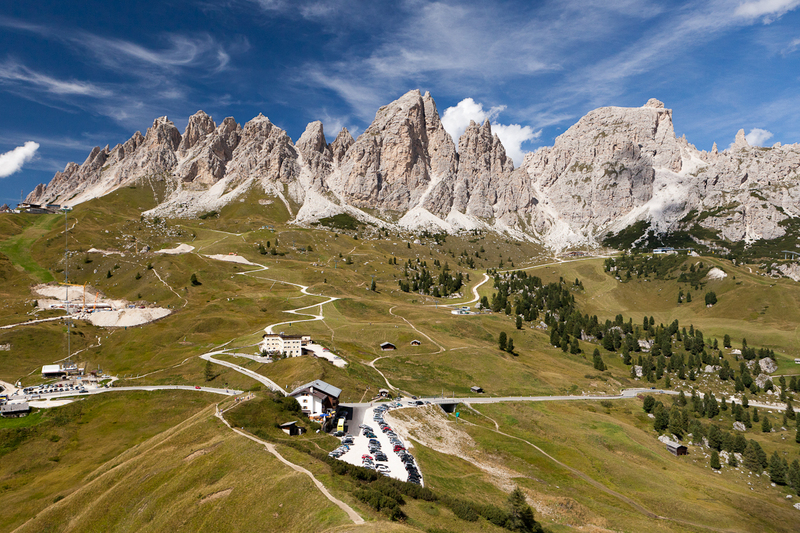 The best thing about the Giro d’Italia is the Dolomites, a subsection of the Alps that contains some of the best mountain riding in the world. The battered, pinkish slopes combine the height and severity of the Alps, with the density of the Pyrenees. The riders climb long and high as you’d expect in the Alps, but unlike the rest of the range, there are no long runs between climbs in which to recover. You come off one Dolomite and start climbing the next. In recent years the Tour de France has made great strides toward erasing its reputation for predictability, thanks to late mountain stages and mini-classics over the Stockeu and pave. Nevertheless, it’s got a long way to go before we forget about the 17 year span of total predictability between the bonkersness of 1992’s all-EU route and 2009’s penultimate day sally up Ventoux. The Giro, on the other hand, has no such problem. In recent years we’ve had floodlit prologues, strade bianche, volcanic ascents, glaciers, and final stage Time Trials. 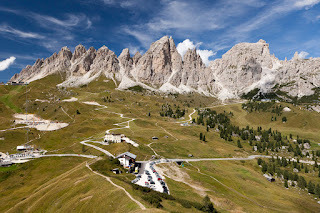 By its own standards, this year's Giro has a positively restrained parcours, but it’s still found enough wackiness to feature white roads, climbs made famous by the Tour of Lombardy, and a 32KM ITT on the last day. Oh, and did we mention a preposterously lengthy blat along some very windy coastline. In Denmark. On day two. No one goes to a Grand Tour without a gameplan, a few clearly identified key stages and a set of tactics for each day. But while the fear of blowing the Tour de France can cause that race to be ridden in a tediously cagey fashion, the Giro d’Italia often sees the gameplans chucked out the window as ebullient Italians make unexpected sorties that split the race, where the unpredictable parcours means that favourites are less capable of managing what they’ll have in their legs on a given day, and in which huge breaks containing numerous favourites can escape the Peloton. 2010’s stage to Aquila is a good case in point, but there have been plenty of other days in Giro history where we’ve seen breakaways containing riders that would never be allowed off the front in the more staid TDF. 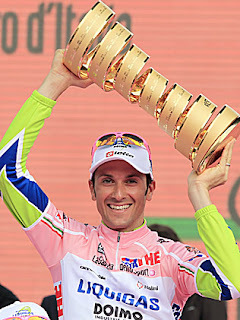 With last year’s winner Alberto Contador absent, this year’s favourite has to be last year’s winner, Michele Scarponi. Ah, the joys of modern cycling. Despite his age, Scarponi is in reasonable form, climbs strongly and has the requisite heroic disposition of a GC rider: when all the other GC favourites cowered in the face of Contador’s first attack last year, Scarponi knuckled down and chased Pistolero and outsider Rujano. Didn’t get him anywhere, mind you. He just got stuck in no man’s land before wobbling back into the pack . Still, at least he had the nuts to try, if not the legs. You are lobsters, I am boiling water. Then there’s Ivan Basso, aging and prone to unpredictable form these days, but with more Grand Tour winning experience than anyone else thanks to his unearthly victory in 2006 and his redemptive win in 2010. Let’s not dwell on his race-losing diarrhoea in 2005. Lacking in acceleration though he is, Basso’s ability to climb hard and steady for hours at a time, day after day, could see him in good stead in the final week, not to mention on the long steady drag up to Cervinia. Finally, there’s Frank Schleck, the lesser rated but in my opinion more robust of the Schleck brothers. He’s shown very little form this season, and is coming in as a last minute substitute. But he’s a proven GC rider in a strong team and he won’t have to spend his time watching out for Andy Pandy, so it might just be time for the less fey brother of the Frandy pairing to shine. Either that or he’ll get his teeth kicked in during the prologue and ITT and disappear into the depths of rankings where even I lose interest. Roman Kreuziger had the form to try on the Giro del Trentino’s climb of Punta Veleno, but not to succeed. A week of reasonable prominence at the Tour of Romandie may have put the finishing polish on that form. the 2005 and 2011 editions. Jose Rujano also almost had it on Punta Veleno, and he’s got form when it comes to the Giro, having enlivened the 2005 edition and been the most reliable Contador-chaser last year. 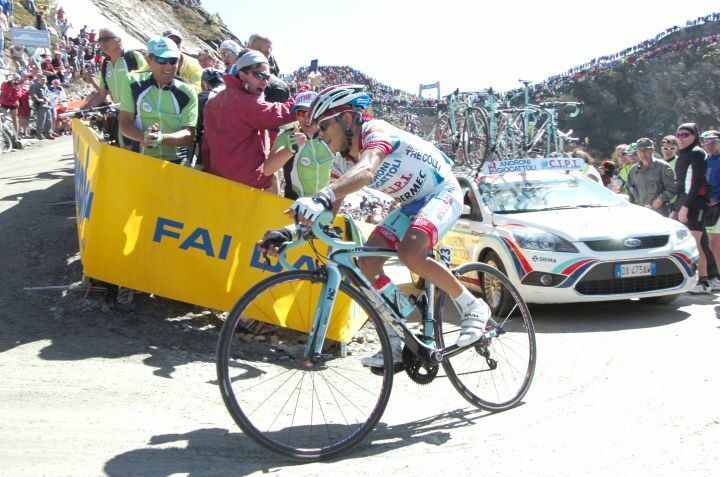 Finally, there’s Joaquim Rodriguez, the only man more destructive than Contador on the steep stuff. Sadly, he doesn’t recover fast enough to land repeated hammerblows, and his time trialling is painful to watch. Nonetheless, he looked very strong while winning Fleche Wallone, and a couple of carefully chosen attacks could put him in pink. Barring some destructive winds on stage two, the Verona TTT on Stage 3 is the first stage that will see a shakeout of the GC contenders. The old logic says that strong time triallists will be held back by their teams, while weaker ones will have their failings mitigated by the eight other guys in the line. That’s true as far as it goes-no one’s expecting Joaquim Rodriguez to lose as much over this 32K as he lost individually over similar distances in the last two Vueltas, for example. On the other hand, in a race that counts Frank Schleck and Rodriguez among its favourites, the first sizeable distance against the clock is going to have an impact, teams or not. I’ll give you good money that at least one major contender will come out of this with nearly a minute to make up. In a race that spends the majority of its third week going uphill, there are numerous mountain stages that you could pick out as decisive, but Cherasco-Cervinia on Stage 14 is the first serious mountain stage of the race, and the first summit finish. On top of that, the final climb is only moderately steep (max 12% but an average of 5%) but incredibly long - the riders will be climbing for 27KM. If a solid chugger like Ivan Basso wanted to put paid to an explosive climber like Rodriguez, this would be the place to do it. The highest ever summit finish in a Grand Tour. 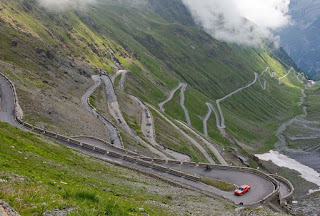 Then there’s the penultimate stage from Caldes to Passo dello Stelvio. This is the one that made David Millar grumpy and kicked off a #Girofolly hashtag when it was announced back in September. The 1883 metre Passo de Tonale, 1173 metres over the Aprica, the short but sheer 851 metres over the Teglia...wait, we’re not done yet....we’ve still got the Mortirolo, considered by some (including Lance Armstrong) to be the hardest climb in Europe, a bucking ascent that continually changes gradient and spends looooong spells at over 10%. Got all that? Great, you’re not done yet, but you’re all warmed up for the next climb, the Passo dello Stelvio. The highest summit finish in Grand Tour history. And they’re doing it up the long side from Bormio, meaning its 22KM of climbing, most of it between 7 and 9%, with later ramps hitting 12%. Christ, I needed EPO just to type that. You could get infected saddle sores from reading it. A day like that could overshadow the entire race, resulting in a 2,800 kilometre neutral start followed by a single day of racing. This being Italy, however, I reckon it’s just as likely that they’ll spend three enjoyable weeks throwing rockets at each other in an attempt to settle things before they get there, then ride the whole thing nice and gently before launching an attack in the final 500 yards. In fact, if Andy Schleck were there, I’d have called that a certainty. The optimist in me looks at this stage and thinks that some riders will see the chance to do something legendary. Oh come on, wouldn't it be great? Sorry, I can’t help it. At least you can’t call me ageist. I reckon he’ll stealth his way into a solid finish without doing anything spectacular. Much like last year. Season by season he’s inconsistent, but race by race he’s steady. He’ll have at least one heroic day in the mountains and no disastrous ones.